My flat runner was ready to go for the 5k on Saturday morning! 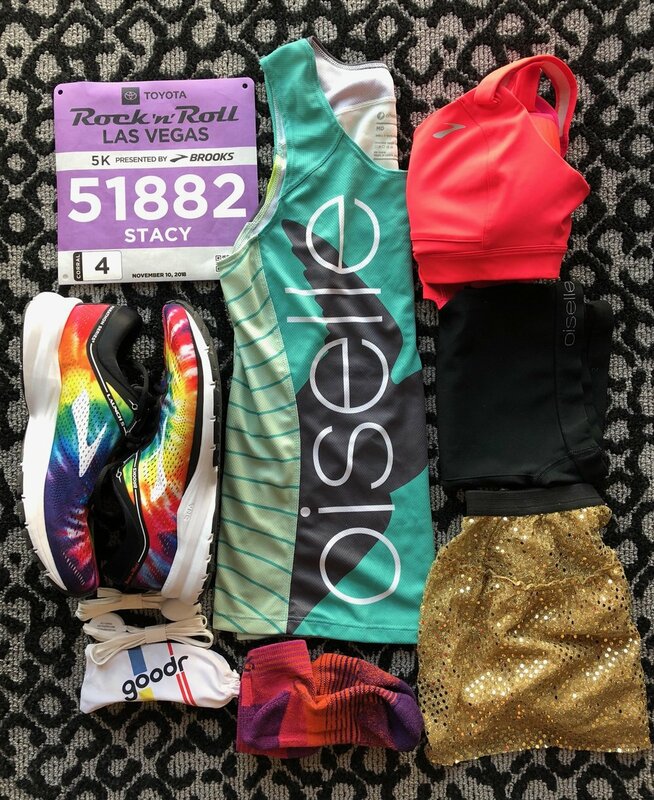 I love to use 5ks before the race to get my legs to turnover a bit, but to also really contain my excitement for the actual race day (that’s major self-control PEOPLE!). The start line is held at a large outdoor fairground (…I think? ), so there’s plenty of space for everyone and they did a really great job of highlighting where each corral would start. Light-up shoelaces ready to run! I got these shoelaces with the purchase of my Rock n Roll Special Edition Books shoes at the expo! We headed to our corrals around 5:45pm and it was really well organized (better than last year) as far as having one entry point and a volunteer checking everyone’s bib/ pointing where they should go. I really didn’t stand in the corral for too long before the race began (I was in corral 4) and soon each corral was taking off (they held each for 1 minute between sets?)! My goal was to keep my pace somewhere in the upper 9’s/ low 10’s (easy) and then throw-in 4 x :30 pick-ups after mile 2. The race course isn’t too exciting, but they definitely had more course entertainment than last year. I didn’t bring my headphones and just soaked up every minute of this (basically) out-and-back course. It was so much fun to finally pick up my speed after mile 2, but also took a lot of self-restraint to slow back down afterwards! I’m super happy with my finishing time and happy to have collected one medal towards my Remix Challenge!